Honors on the Cheap » Harrumph! In early February 1978, the Northeast got it, cripplingly so and in two waves. Boston and New York City in particular were paralyzed. I wouldn’t move to the former from the latter until the next year. In 1978, I saw cross-country skiiers high above the normal road level poling by my West Village windows. My wife and I worked in mid-town a little over a mile apart, she at Scholastic Magazines and I at American Management Association HQ in the publishing part, AMACOM. Unlike trolley and car dependent Boston, New Yorkers moved by subway. The underground was just fine, thank you very much, even though sidewalks were more a hidden concept than anything visible. Most AMA employees lived in the sticks suburbs. They were stranded. A subset of us in town struggled our way to the subway stations and the short distance to the HQ on the other end. The Scholastic/AMA attitudes to the loyal do-bees holds a management lesson. In perspective, this AMA had long been addicted to rewards on the cheap. Their main business was providing educational programs for executives, with an underlying motive. Companies paid for the managers to take a trip to the site, charge some meals and hotel, and just maybe come back a tad better at what they did for a living. Companies understood that the price was a bargain — it was a one-off that didn’t add to the base salary package and thus have to be built on annually. At Scholastic, the slogging workers who kept the shop open got catered meals and when all returned public acknowledgment from the big shots — plus a bonus. At AMA, we got (beat, beat) ta da! a Plexiglas paperweight. Click on the thumbnail above to have a closer view of this 5.5 x 3.5 inch treasure. Revel in its power. I had forgotten until we moved recently. I found it along with several similar tchotchkes. I now vaguely remember keeping it for its absurdity value. 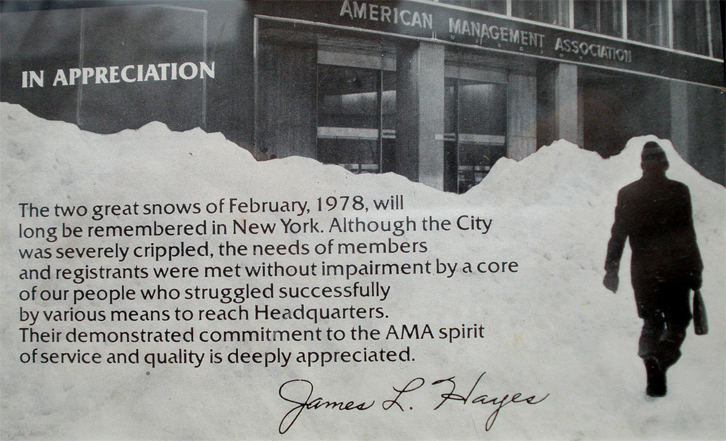 AMA’s president, Jim Hayes, appears on it in the form of his stock signature. Come to think of it, there were so few of us in the storms, it would have been a small thing for him to sign the cards individually before each was encapsulated for “short-term eternity”. Nah, we at AMACOM often heard that it was a great place to be from…that it looked good on the résumé. That was true enough. Yet, like soldiers, slaves, peasants and other minions, we did not get our rewards in our daily lives. We had lower wages than others in Manhattan for similarly skilled writing, acquisitions and editing. For many of us, the from AMA could not come too soon. We can measure the depth of that appreciation today in the 5/8th inch of plastic. The message was that we did what was expected of us. I had a slightly more personal stake in the paperweight as well. Many months, I played that same James L. Hayes in my small, subservient way. Most of my work was on the monthly magazine, Management Review. I acquired and edited some main articles, was totally responsible for the separate little magazines inside in their domestic and international editions. Also, many months, I ghosted Hayes’ president’s column in the front of MR. He was a charming and affable fellow, a perfect association president, and a great spontaneous speaker on general management subjects. Alas, he was an awful writer. To his credit though he knew that and certainly had enough managerial skill to be sure that a couple levels below him was enough talent to take care of that for him. Hayes was fond of my ghostwriting. My references and quotes from ancient Greek and Roman as well as more modern European writers and philosophers made him look well read and analytical. There really wasn’t any harm in such veneer, as underneath, he knew the business theory that AMA members craved. This plaque speaks for itself. I hope that in the years to come, it will be a reminder to you of my deep appreciation for your outstanding efforts in the winter of ’78. I am reminded and chuckle once more. The snows were deep, the appreciation shallow.